The Gospel Reading for the 4th Sunday Year C – 3 February (Luke 4:21-30) offers us an invitation “to check our assumptions and biases” especially when we are confronted with any prophetic challenge. The following reflection by Veronica Lawson RSM first appeared at www.mercyworld.org. It is offered here for your reflection. In the coming week let’s remember that Jesus came to show God’s love for all people. 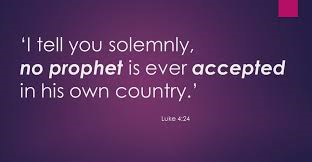 May we be alert to any sense of exclusive entitlement within us which might be being challenged by prophetic people in our community, Church and world today.